Everyone’s more ecologically minded today. We’re more aware of the trash that we produce and dump on the environment. Many people are doing their best to reduce the trash they produce and will think of ways to achieve this. One of the ways we can actually reduce trash is by using reusable lunch boxes like the Ojue Lunch Box. What people commonly do when packing lunch is to wrap food in plastic wrap and then put it inside paper bags. It may be convenient since these packing options are usually available at home but they do add up as trash and just contribute to the land fill problem. Using reusable lunch boxes is more environmentally friendly because you get to use the containers over and over again. The problem is that many people think that bringing lunch boxes is lame and, in an office environment, doesn’t make them look cool. 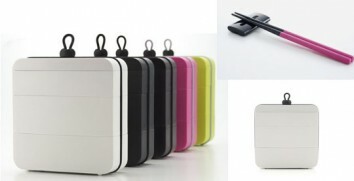 But the Ojue Lunch Box brings the coolness factor to lunch boxes. This is an economical, environment-friendly and very classy lunchbox that also has a great space-saving design. The lunchbox is actually composed of three containers but these stack up seamlessly one on top of the other. The three separate containers means you can bring three different dishes with you for lunch. A three-course lunch is entirely possible with the Ojue Lunch Box. But more than just stacking, the genius part of this lunch box is that the containers stack vertically and fit upright inside the lunch box, so even when you’re in transit you won’t have to worry about spills and leaks. It’ so safe you can actually put the lunch box inside your bag without fear that sauce or soup will leak out and ruin your bag and the gadgets inside. With its very high tech industrial design, you can even proudly lug it around and people will think you’re carrying your gadgets inside and not your ham sandwich.